*The Olympus D-425 has a low slung horizontal frame that thickens slightly along the left side (when looking at the lens). The camera body is composed of plastic and dressed in a brushed silver coating. The only grip on this camera is a polished silver ridge vertically positioned on the right side of the camera’s front face where the camera body begins to thicken. The somewhat small and understated 1.5-inch LCD screen is located on the left side of the camera’s back face and protrudes slightly from the camera body. The lens cover on this model is manually opened with a sliding switch that is situated beside the lens on the front of the camera, an awkward setup for those rapidly developing shooting situations when an extra step can compromise the shot. The physical design of the D-425 is reminiscent of 35mm point-and-shoot cameras that were sold during the nineties, but lacks the density and durability of the older models. Unfortunately, one fall and this camera will likely be transformed into a desktop ornament. *Designed for portability and transport, the D-425 is light enough to hold without becoming taxing to the user. The rectangular camera will fit securely in one hand and is fitted with a wrist strap loop on the right side of the camera body to provide added security when not shooting photos. However, the extremely lightweight body feels feeble, even when the camera is filled with two AA batteries. Prior to the installation of batteries or memory cards, this camera only weighs 4.2 oz and is 4 x 2 x 1.4 inches excluding any protrusions. The smooth, flat design of the camera body assures that it will not get caught on pockets or other storage containers when not in use. The port cover on the left face of the Olympus D-425 fits firmly in place and its edges cleanly align with the surface of the camera body without a struggle. *With no design feature on the left side of the camera body to restrict meandering fingers, the lens of the Olympus D-425 will be in constant jeopardy of obstruction. Without rubber gripping pads or other features to stop the user’s hands from slipping, the potential for dropping this camera seems high. Couple this with the camera’s lack of durability and it might mean a quick $120. Additionally, the battery cover for this camera catches and disengages when being opened and closed, making it seem as though the lifespan for this cover will be rather brief. On the plus side, the small size and light weight body should aid in handling and enable users to shoot with one hand for extended periods of time. Entering and exiting menus and shooting/playback modes is quick and easy due to the external controls located on the back of the camera body, although the mode dial is harder to control with the same speed and accuracy. *Overall, the controls on the Olympus D-425 are minimal and well dispersed, with an adequate amount of space allotted to each control. The rather sparse design of the D-425 is beneficial for rendering quick and accurate setting alterations without requiring awkward hand movements. The on/off switch is located on the front of the camera beside the lens cover, which also opens and closes the manual lens cover for the camera. The placement of the switch is understandable when considering the dual role it plays as the open/close control of the lens cover. When the camera enters sleep mode, the cover returns to the closed position and the user must turn the camera off and then back on when beginning to shoot again. The control placement and size of the buttons on the back of the camera are well conceived, although somewhat humorous looking, as the navigational and mode dials rival the size of the LCD screen. The oval-shaped four-way controller is a single continuous ring and has other secondary functions allotted to each cardinal direction. The D-425’s mode dial is placed on the camera’s back face, making it tedious to use with only one edge of the dial actually exposed for manipulation. The placement of the dial encourages users to control the function with their right-hand thumb, making quick changes nearly impossible and potentially leading to missed photographs. In most cases the user will have to divert their attention away from the action and focus specifically on altering the mode dial setting before returning to photographing. Other controls on the back of the camera body such as menu, delete, and shooting modes are smaller in size, but contain universal symbols placed near or upon them, allowing for instant recognition and easy use of the controls. 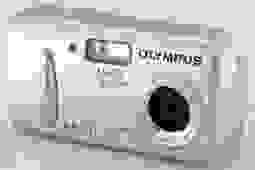 *The Olympus D-425’s menu button is situated beside the lower right-hand corner of the LCD screen, on the back of the camera body. Once the Menu button is depressed the user is able to access some basic settings using the four-way controller/OK button. The menu allows the user to alter image size, date/time, and EV Compensation as well as some generalized settings found within the setup subsection. When altering the Exposure Compensation (EV) setting, the menu format switches from an opaque backdrop to a live feed with a transparent overlay displaying the various options. The switch to a live feed display during EV compensation is a pleasant surprise and will help users attain the desired exposure for the shot. This live feed allows the user to directly view the resulting lighting effect from altering the EV Compensation scale. The menu of the D-425 remains in line with most Olympus models and is easy for any level user to understand and adjust to. The multi-screen or page format begins with a single page broken into four graphics and accordingly leads users to the various settings. The only downside is that the camera’s resolution settings revert to the second highest quality setting, which will force users looking to maximize resolution to become familiar with the menu to a frustrating extent. Users of the Olympus D-425 should expect a straightforward point-and-shoot camera that will do the work for you. The camera offers direct, largely fixed options, clearly labeled controls, and basic menus that are not going to overwhelm or confound a beginner. If the user begins to push the camera by taking images at night and in other complicated lighting situations, they may find the lack of input and technological depth of this camera to be restrictive. A few alterations could have be made to the placement of the on/off switch and the mode dial, but once the user becomes acclimated to these controls, the generous size and space of external buttons will be appreciated and enjoyed. Consumers seeking an automatic camera for snapshots will get a selection of preset modes and basic video that can be captured at 30 or 15 frames per second with the D-425. This camera’s layout, format, and design will not intimidate even the most novice user and make it ready to shoot with right out of the box.